Tefzel Cable Ties | Tefzel Zip Ties | Tefzel Wire Ties | Cal Fasteners, Inc.
Tefzel is a unique plastic material that offers excellent resistance to radiation, flames, ultraviolet (UV) light, chemicals, and high temperatures. For applications requiring these special capabilities, Cal Fasteners stocks Tefzel cable ties in 12- and 35-pound capacities. These Tefzel wire ties are engineered to provide exceptional durability and ease of use. High tensile strength is achieved thanks to one-piece construction and special pawl, teeth, and transition rail designs. Finger grips and tapered tails make handling, alignment, and tightening simple. Low insertion and pull through force make them easy to install. 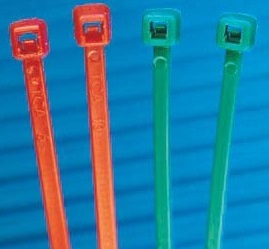 Request a quote on Tefzel zip ties for your project, or contact Cal Fasteners to learn more. *Tefzel is a trademark of Dupont.